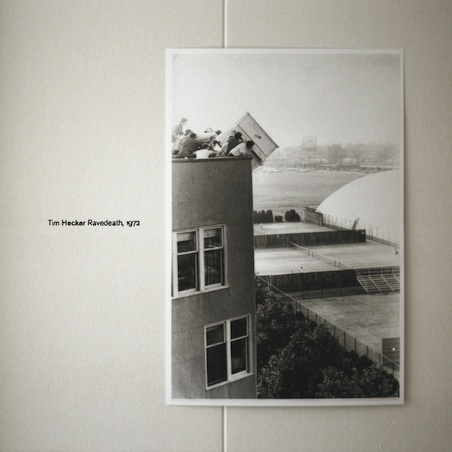 No matter how many times one listens to Tim Hecker’s albums, their contents seem to keep shifting and reshaping, pulling in different directions, taking on different qualities, and producing different effects each time. They require an interaction between listener and what’s captured in the recordings that goes beyond listening to songs play from start to finish, as Hecker excels at building pieces around partial melodies and textures that suggest more melodic progression than they actually present. That being the case, the sense of music unfolding will differ for every listener, and that’s always been one of the more interesting aspects of this style. What Hecker does has long been referred to as structured ambient, but, that structure is relative. The tendency when presented with this sort of music is often to reach for explanation, to look to any images or text which might accompany the record; or to any recognisable source sounds to provide a possible means of understanding the whole. Many reviews of this record have pondered the relation of its titles, artwork, and the information provided on its recording to the actual music, but the overall aesthetic remains cryptic. The key to this record, really, is immersion, experience of the space it creates. Hecker’s skilful processing and blending of sources leaves little out in the open, and much of the record unfurls in dense clouds of tones which emerge and dissipate slowly, enveloping and engulfing the listener. The result is an absolute sound, of everything all at once; a sound which implies things beyond sound. This notion of some ineffable correspondence relates to a thread found in some recent articles stating that Hecker’s work (among others) could represent a sort of contemporary, secular sacred music. Ravedeath, 1972 is not, however, reverential. Unlike 2009’s An Imaginary Country, which in many places soared and drifted off into beautiful absolutes, the ecstasy of Ravedeath is bound up in tensions. It’s a darker effort, in which the moments of beauty are managed by a predominant greyness. Anyway, if you know Hecker’s work – especially his last couple of records – you’ll know, ostensibly, what to expect here. It’s an impressive addition to his acclaimed œuvre, further cementing his place as one of the most recognised and admired sound artists of his time.